3rd October, Taichung: Singapore stamped their mark in the Doubles event on the second day of the 19th Asian School Tenpin Bowling Championships after their A Team boy's first pair and B Team girl's first pair topped the opening squad. Singles gold medallist, Genki Hayashi partnering Takumi Shinsha, started off brilliantly with a sizzling 536 to take the early lead, 59 pins ahead of Australia B Team of Joshua Morris and Nixon Chan in second. Saudi Arabia Team A pair of Khalid A M Albyudh and Ahmed Abualreesh showed promise in third. The Japanese pair added another big game of 477 to stretch their lead to 145 pins as the Aussie pair downed 429 to stay in second. The other Australian A Team pair of Callum Borck and Daniel Perrella rolled two consistent games of 208 and 429 to move into third. Although Japan stalled with a rather low game of 365 in the third, they held on to their lead albeit with their margin reduced back to 59. Australia B1 made good progress with 451 to move closer to the leader. But Hayashi and Shinsha bounced back with a stronger 488 to stay in the lead. Brandon Ong and Gerald Teng of Singapore A Team posted 484 in the third and 491 in the fourth games to take over second spot. 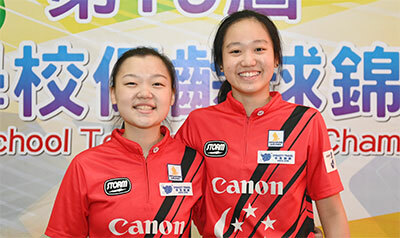 The Singapore pair clinched the win with 2661 after ending with 448 and 441 in their last two games. Japan suffered another low game of 349 in the sixth game to settle for second with 2646. Borck and Perrella ended with 409 to edge their compatriots for third spot with 2564. Meanwhile, Singapore girls also stamped their mark by winning the opening squad when Lu Yi Quek and Singles bronze medallist, Arianne Tay of Singapore Team B totaled 2343. Australia Team A of Jamie Phelan and Grace Fahy, who made the early running and was tussling with Singapore throughout the squad, settled for second with 2314. Singapore Team A's Fiona Yew and Arielle Tay finished third with 2290. Japan's Erina Ishimoto and Saki Tachibana took fourth position with 2249 while host, Liu Pei Xsuan and Yang Shih Yu of Chinese Taipei A completed the top 5 with 2210. The second doubles squad for both the boys and girls will take to the lanes after the break. The top 3 pairs with the highest pinfalls will be awarded the medals. Competition will shift to the Team event bowled over two blocks of 3 games each on October 4 and 5. The top 3 teams with the highest total pinfalls will be awarded the medals. The top 16 boys and top 16 girls in their respective All Events standings based on the 18 games contested in the three events will qualify for the Round-Robin Matchplay Masters finals to be staged on October 7 and 8.